As they listened to the strange inquiry, they each had the same reaction. It was November 2013, and three former Pitt wrestlers had joined the workforce after finishing school in April: Donnie Tasser helping to coach junior and high school wrestling at his alma mater, Belle Vernon, and doing freelance sports writing for his hometown newspaper while living in Shadyside; Zac Thomusseit, working in Michigan as a sales representative with Milwaukee Tools; and Matt Wilps, staying around Oakland as an assistant coach with the Pitt wrestling program. These were the circumstances under which, seemingly out of nowhere, each received a call from someone who wanted to know the answer to an odd question: Any interest in trying out for a spot on a NASCAR pit crew? NASCAR? Pit crew? Them? It had to be a joke. None followed the sport, and their familiarity with cars and tools was minimal at best. “We sort of dismissed it and didn’t really think of it as a legitimate thing,” Wilps said. 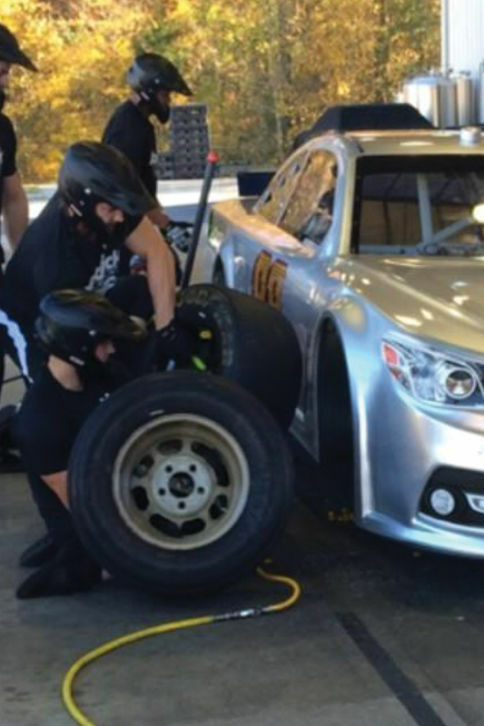 But familiarity with NASCAR, or cars in general, isn’t actually all that important for incoming pit crew members, who primarily change tires and fill the vehicles with gas. Add that the caller’s curiosity was genuine and, one by one, they came around. This Friday night, all three will work trackside at the famed Daytona International Speedway in Florida as members of pit crews in the Nextera Energy Resources 250, the opening race of the NASCAR Camping World Truck Series. The opportunity came about thanks to the person on the other end of that phone call: Devin Dietrich, a former high school wrestling coach in Grove City. Dietrich, now a commercial real estate review appraiser for a bank in downtown Pittsburgh, still actively followed the sport in the six years since he’d stopped coaching and wanted to continue his connection with it. So, in 2013, he began trying to set wrestlers up with NASCAR teams. “It started trying to help one guy out, and that led to networking with a few teams and establishing relationships,” Dietrich, who isn’t paid for his services by either party, said. Dietrich reached out to Pitt head wrestling coach Jason Peters that fall, wondering if he had any former athletes who might be interested. After those initial phone calls, he began working on getting Thomusseit, Wilps and Tasser, along with a few other former wrestlers, tryouts with Joe Gibbs Racing. But when Gibbs abruptly stopped its developmental program in December of that year, it looked like their opportunities had disappeared before they’d even begun. But Dietrich kept working and eventually found another suitor: Hendrick Motorsports. By this point, it was 2014. In June, Thomusseit went down to the Hendrick Motorsports headquarters in Charlotte, N.C., and tried out. Competing against 49 others, he went through agility, speed and strength drills. He impressed them enough to receive an invite back the next month for a second, 25-person tryout, where everyone worked at one of the three positions they’d likely hold on the pit crew, which is determined the person’s height and body type, and put through pit stops. Thomusseit, who wrestled as a heavyweight, worked as a carrier, and had the responsibility of putting new tires on. First, the jackman raises one side of that car up. Next, someone called the carrier takes the old one off after removing lugnuts with an air gun, and then moves the old tire out of the way. From that group, Thomusseit was one of six to be offered a five-year developmental contract in August that began in January. After speaking with Thomusseit a week after the first tryout, Tasser decided to give it a try, too. “Maybe there is something to that,” Tasser said. He promptly called Keith Flynn, the developmental pit crew director at Hendrick, and set up a workout. Wilps, coincidentally, was going on a family vacation to the Outer Banks around the same time and joined in, contacting Flynn a couple of days before the tryout to secure a spot. The two drove down to Charlotte together in the first week of August. “It was kind of spur of the moment,” Tasser said. The pair went through the same two-part tryout process over the next two weekends with one other person, Tasser practicing as a changer and Wilps as a carrier, before receiving a phone call asking if they could be in Charlotte the first week of September, when the rest of the developmental class would start. The trio even making it that far was noteworthy. Previously, pit crew members who were former college athletes almost entirely came from other sports like baseball and football, according to Flynn, who coached high school and college football for 25 years and was also a high school athletic director before beginning his work with pit crews. But the athleticism, strength and mental toughness that made them talented wrestlers (Thomusseit and Wilps were All-Americans and Tasser competed at the NCAA Championships) translates well to their new endeavor. For the last part of 2014, they spent their days working out at the Hendrick facilities, practicing pit stops on a covered stretch of concrete and doing grunt work for the Cup teams during their practices. Initially, they and their teammates struggled with their still unfamiliar pit stop tasks. However, with time, they improved enough for each to not get fired ­— a common occurrence — and join a specific driver’s team within Hendrick: Tasser with Dale Earnhardt Jr., Wilps with Jeff Gordon and Thomusseit with Jimmie Johnson. If they continue to progress, they will be offered Cup car contracts after two years. Speaking in December, Tasser said the developmental crews averaged 13-and-a-half- to 19-second pit stops, while the people who pit for Sprint Cup, NASCAR’s highest level, complete their pit stop duties between 11 and 13 seconds. Since their new assignments, the three men’s schedules changed somewhat. Instead of lifting with the other developmental programs members, they do so with their teammates, attending their meetings and specific practices, still training together in the afternoons. All three 25-year-olds live together, as they did in Sutherland Hall their freshman year, with a developmental pit crew member for Michael Waltrip Racing, who Thomusseit met during his Hendrick tryout. All of their success could start a flow of wrestlers to the profession. Note: Donnie Tasser was a member of the sports staff at The Pitt News from 2010-2013.